I am considering going back to drawing cards each day to post here–if you’d like me to do so, please comment below and let me know! 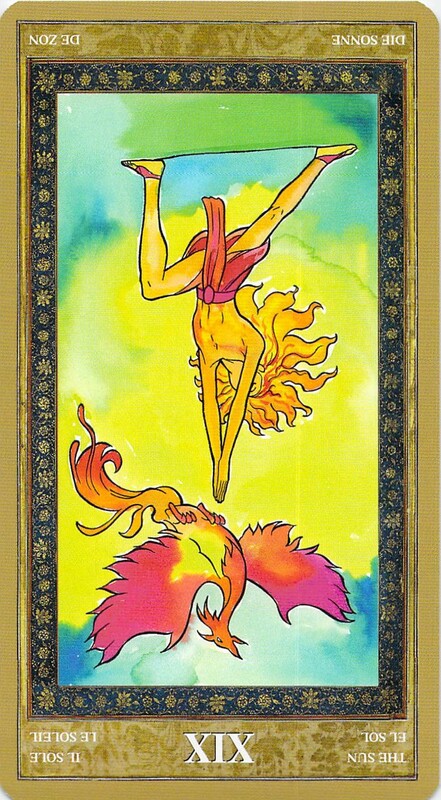 Today, I drew the reversed Knight of Swords and reversed Sun, from the Yoga Tarot. For those of us who are struggling with depression, these cards contain an important clue that can help us. First, I see the Sun reversed as an indicator of depression, but it’s also reason for hope. The Sun is always with us, just as the capacity for happiness is always in us. But sometimes it is clouded (a little, with feathery cirrus clouds, or a lot, as when the sky is gray and overcast and ready to storm). 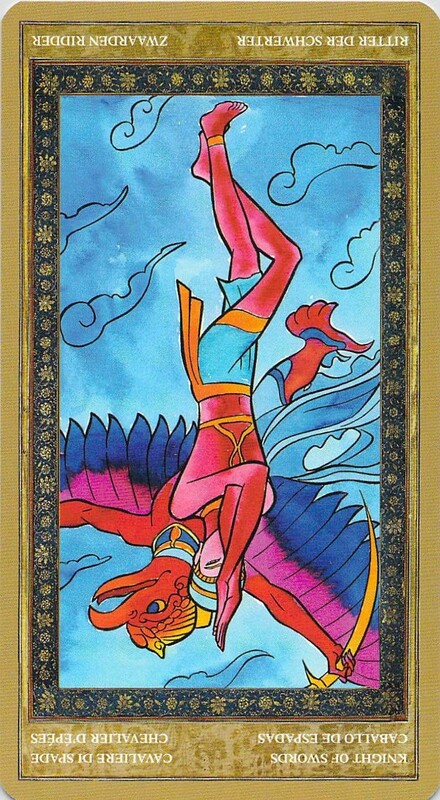 In this case, our capacity for happiness seems clouded by the Knight of Swords and his/her steadfast commitment to rationality and fixed ideas. These ideas have our poor Knight tangled up in knots! The knots are not true obstacles, of course. They are just Eagle pose. But to soar like an Eagle, the Knight will have to loosen that commitment to rational, fixed ideas, just a little. Because flying defies rationality. Moreover, in this case, the fixed ideas in question have to do with the inner wounds that we are carrying around — yes, I know you are rolling your eyes at this, but the truth is that we do carry inner wounds around and feed them with our rational ideas about how things should be. Rationally, nobody should ever hurt us. And intuitively as well, it’s also true that no one should ever hurt us. But we can’t heal until we come to an understanding of those wounds — and we can’t come to that understanding through the use of reason alone. We have to let our intuition flow around the situation like a cloud (even if it makes us depressed for a long time), because only intuitively will we be able to reach an understanding of why bad things happen. When that happens, we can do more than soar like eagles — we can rise out of our own ashes, like the Phoenix (aka Sunbird). Previous I was interviewed by the Tarot Lady! Thanks! I am setting a goal of drawing cards daily again — we’ll see how it goes! Thanks, Lindsey — I think I will go back to drawing cards daily again for a while–we’ll see how it goes. Thanks for these drawings- please keep drawing and posting them on Zurker! Thank you for sharing your drawings. I enjoy reading your interpretation and inspiration for the art work. It helps me look at the cards in a different way. Hope you will continue. Thanks, I’m glad you liked them–but, as I told Jason, these aren’t my drawings, they’re from the Yoga Tarot by Lo Scarabeo. The artwork is by Adriana Farina. The interpretation is mine, however. 🙂 Sorry for the confusion! I stumbled here via your interview with Tarot Lady and followed you, and I’d be very interested in reading about the cards you draw each day. I’m considering doing a similar exercise myself, though admittedly… I don’t feel so bold as to post them online! Thanks–I have pretty much decided to go back to doing a daily draw for a while. So glad you found me through Theresa’s interview!